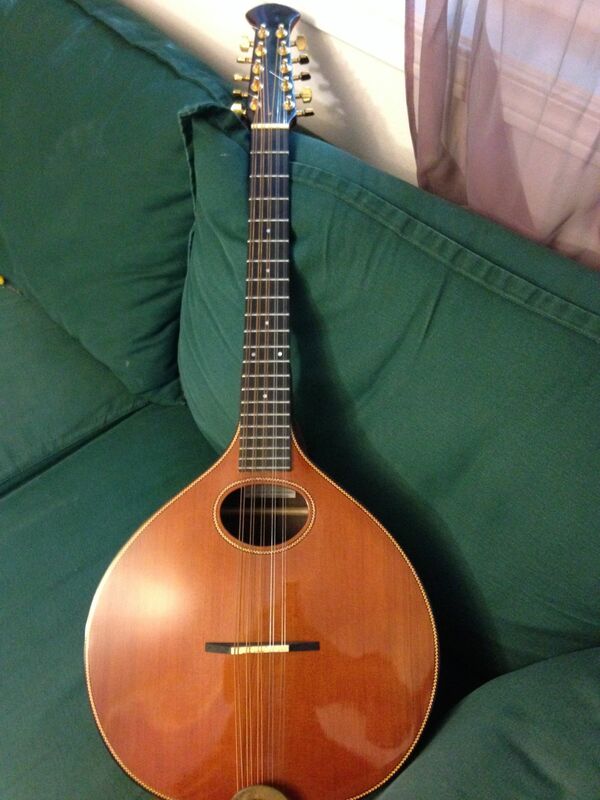 Check it out, a cittern! BUT, my friend Ellen, who y’all will remember is participating in the work on the Bone Walker soundtrack, dropped a bomb on me. In that she does in fact own a cittern. And this past weekend, when she came over to do some recording work, she brought it with her! And told me we could babysit it for a while, since she hasn’t played it in ages! 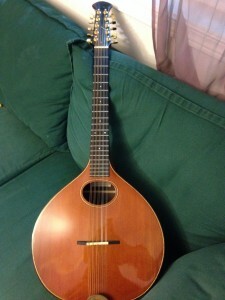 So check it out, this is what a cittern looks like! And for those of you who are instrument geeks, the instrument’s a Sobell. Made by this gentleman, or so I am informed. My immediate goal with this: try to figure out how the hell to tune it. Ellen said she had no recollection whatsoever of how it had been tuned before, so I had to turn to the Intarwebz for help. That led to learning that there is apparently quite the range of ways people tune their citterns, including GDADA, GDAEA, GDAEB, CGDAE, DGDAD, DADAD, and more. I thought GDAEB sounded promising, since that’d be adding an extra fifth on top of the GDAE tuning I already know. Only problem there: B, apparently, was too much for the high course on this thing. It popped one of the strings when I tried to make it up to B. AUGH. And Ellen ruefully admitted that the current set of strings was probably older than her 13-year-old, so the instrument’s long overdue for a restringing regardless. So Plan B: take it to Dusty Strings, ask for advice on how to tune it and what strings to use, and go from there. (Oh DARN oh DARN an excuse to go to Dusty Strings! Whatever was I to DO? I know you feel the burden this placed upon my soul, Internets.) This proved highly instructive. The guy I talked to at the store promptly took measurements of the strings currently on the instrument so he could identify their gauge, and then measured the length of the scale on it too. That led him to recommend that I tune it in DGDAD. And I wound up buying individual D’Addario strings of his recommended gauges, which turned out to mean a mix of light and medium strings. So this’ll be an interesting experiment all around. Once I get it restrung, then I get to figure out how to play it. Hunting for chord charts for a cittern turned out to be a Challenge, as the only chord charts I could find on preliminary Googling were for different tunings and therefore not immediately useful. BUT! I discovered an app called Fretter, available for both Android and iOS, which I daresay will solve this problem nicely. This app’s a clever little beastie and will let you specify all sorts of different tunings for all sorts of different instruments, including custom tunings. The Android app (which I can now play with, thanks to my new Nook HD!) appears to be cleverer than the iOS version in that it can let you do truly custom instrument settings, as opposed to the iOS one, which just lets you specify custom tunings on the instruments it knows about. So I’m going to play with this app and see if I can get it to generate enough basic DGDAD chords to cover the various Great Big Sea songs I know. If I can get it to give me G, C, D, Em, Am, and Bm, that should be a lovely start.